Ashok Abhayakhumar welcomes Rahul Padmanabha, EDPNC India office representative to his residence and the Research Triangle. Through our foreign direct investment strategy (FDI), Wake County Economic Development (WCED) has identified a list of countries for the organization to proactively and strategically focus our efforts. One country whose connections with the Research Triangle proved to be particularly strong was India. There are currently 23 Indian-owned companies in the Research Triangle, including Aurobindo Pharma, HCL America, Infomerica, Selma Precision Technologies and Infosys (Wake County’s largest announcement to date). Overall, these 23 companies are contributing approximately 3,000 jobs to our community and millions in capital investment. In just two years (2016-2017), new investments made by Indian-owned companies in the Triangle totaled $57 million. A highly-talented workforce, the innovative and collaborative ecosystem, pro-business climate, and stellar quality of life are all contributing to this long-standing and growing relationship between the Triangle and India. Furthermore, there is a large Indian community in the Triangle that have found success and are spreading the word to contacts in India that the Triangle Region is a strategic location for other Indian-owned firms. University and state resources have also been allocated to India as well. Duke University has recognized India for strong talent recruitment opportunities and idea sharing initiatives. According to a recent article by the Triangle Business Journal, titled “How Duke University plans to develop synergies with India,” the university has opened several small offices in India and is actively building partnerships with the colleges and medical schools in India. Additionally, in October of 2018, the Economic Development Partnership of North Carolina (EDPNC) announced the opening of their FDI office in India which is led by Rahul Padmanabha. Formerly with SelectUSA, the federal arm promoting FDI into the United States, Rahul will now be marketing and selling North Carolina as a strategic U.S. location from his office in Bangalore. We recently had the opportunity to meet Rahul during his visit to the Research Triangle region, at a reception hosted by the Research Triangle Regional Partnership. Fifty members from the community came together to welcome Rahul to the Triangle and show support for the work he is doing in India. A few in attendance included Senator Rick Gun, Senator Jay Chaudhuri, leadership from HCL, KIPOS Labs, Alphaneurmeric, RTI International, Council for Entrepreneurial Development (CED), and Duke Institute for Health Innovation. 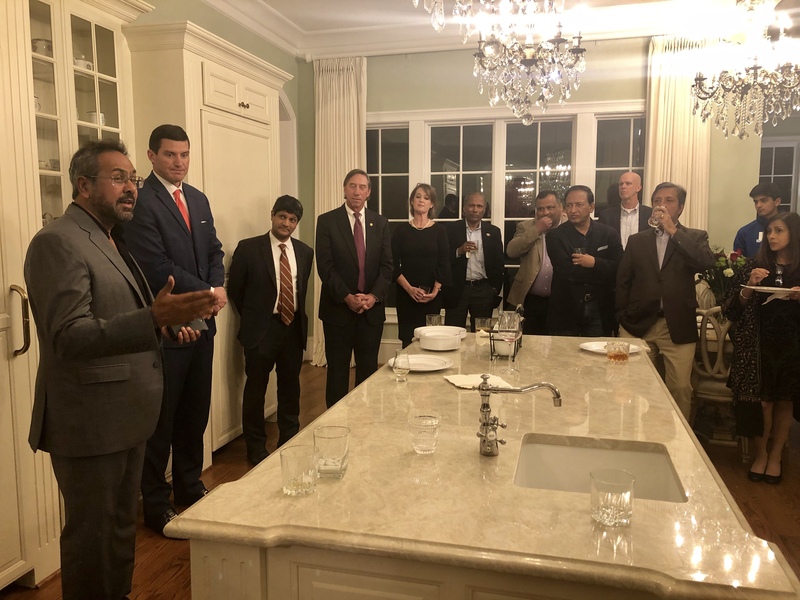 The group shared their experiences and successes in the Triangle region and offered support to Rahul as he works to attract new jobs and investment to the region. It was a great example of the collaborative nature of the Triangle business community and the importance placed on this partnership. The connections between the Triangle and India are strong and gaining momentum. The existing resources and partnerships from the local business community, the EDPNC mark a clear path for continued interest and foreign direct investment from India and the creation of new jobs and investment for the region.